Below is a chart showing Florianopolis Surf beaches along with their rating and type of break. 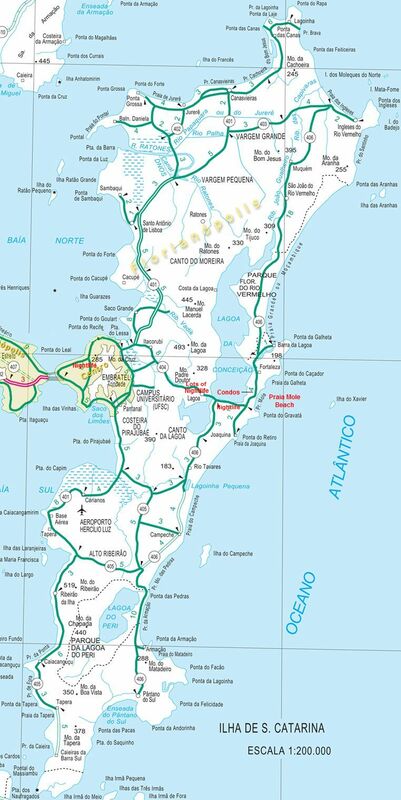 Below that is a Map of Florianopolis to show where these beaches are located. My Florianopolis beach house is located on Praia Mole beach (noted on the map in red), which has great surf year-round and is also one of the most beautiful and popular beaches in Florianopolis. Contact me for rental availability. Anyone who has visited Florianopolis knows that Praia Mole beach is the best year-round location on the island. Literally translated, "Praia Mole" means "soft beach" and is named so due to its extremely soft and deep sand. Praia Mole beach is centrally & conveniently located on the east coast of the island and is popular for its abundant beautiful people and great surfing, which is why I purchased my Florianopolis vacation home here. It is also popular because of its convenient location, being the nearest beach to the town of Lagoa da Conceicao, where you will find a majority of the island's bars, restaurants, grocery stores, gift shops, and year-round nightlife. The surf on Praia Mole is known as being stronger than most other beaches, which suits the surfers just fine but can be dangerous for inexperienced swimmers during days with large surf. Surf can range anywhere from 0 feet to 20 foot faces during the winter months. For weak swimmers and children, the north end of the beach offers a protected cove where the water is always calm and swimming is safe even on some of the largest days of surf. On the beach at Praia Mole, you'll find a volley ball course, a juice bar, and 6 different restaurants that double as beach bars. During the summer months (Dec - Feb) these bars will either have a live DJ or loud music because Brazilians love to dance wherever and whenever the opportunity presents itself. There is always something going on at Praia Mole. Joaquina beach (just south of Praia Mole) is one of the best surf beaches in all of Florianopolis and is usually the site of the annual WCT surfing championship. The area surrounding Joaquina beach is environmentally protected sand dunes so there is no housing near the beach but it isn't far from Praia Mole so this isn't an issue. This beach is not very beautiful since it is surrounded by nothing but sand dunes and lots of tour buses who drop off visitors from the interior by the hundreds. However, the surf is great, especially during large swells. This is one of the few beach breaks that holds a large swell very well. When the surf is big, it peels left off the northern point. Galheta beach, just north of Praia Mole, is also a great surf spot and much less crowded than other surf breaks since there are no access roads to it but it's just a 10-minute walk on the beach from Praia Mole. Praia Brava is located on the north end of Florianopolis island and the surf is comparable to Praia Mole. Translated, Praia Brava means "furious beach" most likely due to the frequently big and rough surf. This beach is a good 1-hour drive from Praia Mole and downtown Centro, which means it's on the outskirts of the island and not a convenient location for vacationers. However, if you're a surfer looking to hit some different surf spots, this spot will suit you well during a nice swell. This beach is not surrounded by jungle and wildlife preserve like most other Florianopolis beaches. Instead, it is packed with tons of hotels and condo complexes. Unfortunately, this area becomes a ghost town outside peak high season because it is simply too far away from most of the islands nightlife and restaurants.